We have redesigned our Kpreps Kansas Game Day feature this week in order to provide you with a program for things to watch out for in Week 5 action. Admittedly, we are giving you a heavy dose of 8-Man football with Game Day this week as those two divisions are in district play this week. We’ll look at a few of the most important district match-ups at the 8-Man level in just a bit, but first some recent news about the top-ranked team in 8-Man, Division I.
Third-year St. Francis head football coach/athletic director Rodney Yates was the topic of a school board meeting this Monday, a rarity for a top-ranked team and highly successful coach during a season. St. Francis called a special board meeting for “the purpose of discussing non-elected personnel/coaching issue” regarding the football program, according to the USD 297 web site. Approximately 30 citizens attended the meeting. After more than an hour in executive session, the board made a “motion to make no changes in the football coaching staff at this time.” The motion was seconded. Upon vote, the motion passed 6-1. As both coach and AD, Yates has led the Indians to unparalleled program success, especially in football and both basketball, since he came to St. Francis. The Indians, ranked No. 1 in Eight-Man, Division I this season, are 25-2 under Yates. Last season, Sainty was Division I runner-up to Osborne, the first state appearance in Indian football history. 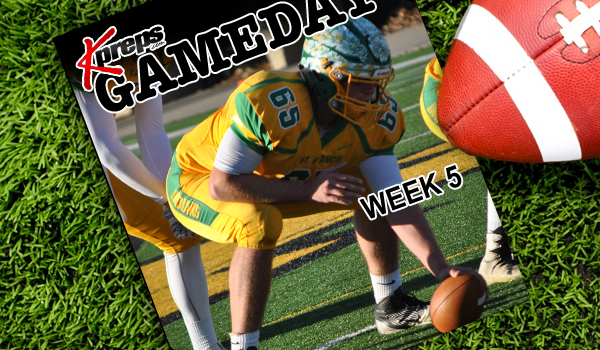 On Friday, St. Francis (4-0) plays host to fifth-ranked Hoxie (4-0) in a key Northwest Kansas League and District 8 matchup. According to multiple sources, it’s expected St. Francis will have a smaller roster size this Friday, but is expected to have all of its key players from a talent-laden team. The Indians’ Hudl roster currently lists just 15 players. St. Francis was well over 20 when the year started. Yates has support with multiple members of the board, according to sources. Yates’ in-laws have significant ties to St. Francis. His father-in-law, Steve Kirkham, has served on Yates’ staff after he retired as athletic director at University of Colorado-Colorado Springs in May 2016. The boys’ basketball team took fourth in Class 1A, Division I under coach Cory Busse last March. It marked the second state appearance and first state win in school annals, according to Kansas historian Carol Swenson. Busse’s son, Tate, has been a standout in football and basketball and a senior this fall. Girls’ basketball coach ShayLinn Zweygardt (Kaus), a former Hoxie all-stater, achieved a great season without a senior last winter. St. Francis finished 12-11, the first winning record since ’02-03 and the first sub-state title game showing since the late ‘80s. Devin Dinkel, who assists in football and basketball and serves as head track coach, led the boys team to a sixth-place team finish in Class 1A in May. The boys captured gold in the 400- and 1,600-meter relays. Sainty scored 36 points. In the previous three seasons, the Indian boys combined for 31 state meet points. While two districts in 8-Man, Division I and one district in 8-Man, Division II began district games a couple of weeks ago, the remaining teams in the 8-Man classifications will start their “second season” this week. The districts that started early have seven teams, an odd number requiring an extra couple of weeks to facilitate a round-robin schedule. Below we’ll update you on the scenarios in the districts that have already started, and highlight a few important district games that we believe will ultimately decide the playoff qualifiers. The combined record for the six teams in District 1 is 21-3. That includes four unbeaten teams through the first four weeks. We’ll start to weed those out this week as Madison (4-0) travels to St. Paul (4-0) in a key game. The Bulldogs are trying to return to glory under second-year coach Alex McMillian. Madison won back-to-back 8M-I state championships in 2010 and 2011, but has missed the playoffs the past two seasons combining for a 5-13 record. St. Paul, on the other hand, ended a 5-year playoff drought by advancing to the state quarterfinals a season ago. The Indians are unbeaten with wins over Frankfort and Axtell from the Twin Valley League in each of the past two weeks. Sedan is coming off an 8-1 season in which the Blue Devils still fell short of the playoffs. As impossible as that sounds, it’s the second time Sedan has finished 8-1 and missed the postseason since 2011. This game against Marmaton Valley was a key component in missing the playoffs last season. The Blue Devils beat Marmaton Valley 40-20, but in doing so only captured 20 district points out of the possible 21-point maximum. Sedan chose not to score late, but ultimately, a 46-24 loss to West Elk in which the Blue Devils committed six turnovers proved to knock them out of the playoffs. West Elk and St. Paul, which Sedan defeated by 10 points in Week 9, each tied the Blue Devils with the same district record, but the Patriots and Indians grabbed the two playoff spots because they had the two highest district points margin. Sedan stayed home with an 8-1 record for a second time in six years. Don’t let the record fool you, Central Burden has played some tough competition so far. The Raiders have losses to Argonia-Attica (3-1), Sedan (4-0) by two points, Caldwell (4-0), and West Elk (4-0). Anthony Blair’s team is going to be tough in this district and may be the favorite to win the district. This one may decide a playoff spot. The Trojans and Knights are two of the top contenders from this loaded district along with defending champion Osborne and unbeaten Bennington. Last season, Victoria fell to Logan-Palco 50-28, but the Trojans still missed the playoffs after losses to Osborne and Solomon. Both of these teams qualified for the playoffs from District 4 last season and Osborne went on to win the state title. Both the Gorillas and Bulldogs enter Friday’s game coming off of their first loss. Solomon was beaten 50-26 by Little River, while Osborne surrendered a late touchdown to lose 30-28 to 8M-II No. 2 Pike Valley. Macksville is trying to get back to the post season for the first time since 2011. In fact, the Mustangs won 10 games in 2011, finishing 10-1 and reaching the state quarterfinals. From 2012 to 2016, the Mustangs won a total of 10 games. Macksville is 3-1 this season with wins over Ness City, Kinsley, and St. John, but South Central may be the best team they’ve faced to date. The T-Wolves are coming off of their first loss, 30-27, to Hodgeman County. South Central is looking for its fifth straight playoff appearance. This may not have been one anyone saw coming, but South Gray is unbeaten behind a solid ground game. After passing the ball 56 percent of the time a year ago, the Rebels are averaging 293 yards rushing per game and handing the ball off 8 out of every 10 times this season. Brock Davis and Austin Jantz have been the primary ball carriers for the Rebels having racked up nearly 900 combined yards. They’ll get tested Friday against one of the state’s most consistent programs in recent history, Spearville. South Gray hasn’t beaten the Lancers since the Rebels finished as the state runners-up in 2011. Probably for a playoff spot, Hoxie already has a leg up on the postseason with a 22-6 win over Atwood-Rawlins County last week. Should Hoxie win on Friday, they’ll be the favorite to qualify as the district champions. St. Francis plays Rawlins County in the battle for the Yoke next week. Two Twin Valley League rivals will meet in Axtell on Friday night. The loser of this one is all but eliminated from playoff contention. We say that because no one is beating Hanover in this District, and Wakefield is also a strong contender for a playoff spot. The winner of the Wildcats and Eagles will still, likely, have to take down Wakefield to qualify for the second playoff spot out of this district. Well known as the best district in 8M-II this cycle, District 6 offers up another good one with Wallace County visiting Otis-Bison. The Wildcats have struggled to a 1-3 start in Kevin Ayers’ second stint as head coach. Wallace County has lost to unbeatens St. Francis (No. 1 in 8M-I), Hoxie (No. 5 in 8M-I), and Atwood-Rawlins County (3-1). Meanwhile, Otis-Bison is coming off an impressive 22-20 win over Victoria. The winner of this game still has hurdles to climb in Hodgeman County (3-1) and Dighton (4-0), but the loser will likely need some help. This matchup between the Bulldogs and Chieftains may decide both playoff spots in this district. South Barber will not only have to respond from their first loss of the season (34-30 to Argonia-Attica), but the Chieftains also gave up their first points of the season last week. South Barber still should be a favorite against Pretty Prairie which gave up 90 points in a loss to Hutchinson Central Christian to open the season. With KSHSAA relseasing new classifications earlier this week, we thought it would be interesting to project the new Class 4A members using the 1-16 seeding playoff system currently used by Class 6A and 5A. This system will be expanded to Class 4A beginning with the 2018 season. *** Keep in mind, we are speculating which schools will be divided among the East and the West. Basehor-Linwood (4-0) has outscored opponents 223-0 and is the lone Kansas team to not allow a point. Basehor-Linwood’s first four opponents are a combined 3-13 on the season with those three wins coming against winless opponents. The will get a little more difficult as the Bobcats host Bonner Springs (2-2) this week. Kapaun Mt. Carmel is the only other team in the state that has yet to give up double digits in total points. The Crusaders have given up just six points and have posted three consecutive shut outs.